Seen from Central Park in New York at 4:30 a.m., the eclipse is nearly over, but the moon stands high, flanked by Orion on the left and Auriga and Taurus on the right. Whenskywatchers think of meteor showers during the month of December, theyimmediately think of the Geminids, which over the years have evolvedinto themost prolific and reliable of the dozen or so annual meteor displaysthat takeplace. And yet, there is also another notable meteor shower that occursduring Decemberthat, in contrast, hardly gets much notice at all: the December Ursids.Thepeak of this meteor display usually occurs on the night of Dec. 22 toDec. 23. 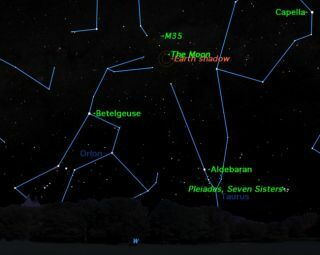 WhiletheUrsids would normally be difficult to see during this time because ofbrightlight from the full moon, the rare upcoming totallunar eclipse may provide a special chance to catch a glimpseof the Ursidmeteor shower. Checkthis NASAlunar eclipse chart to see how visible the eclipse will befrom differentregions around the world. TheUrsids are so named because they appear to fan out from the vicinity ofthebright orange star Kochab, in the constellation of Ursa Minor, theLittle Bear.Kochab is the brighter of the two outer stars in the bowl of the LittleDipper(the other being Pherkad), that seem to march in a circle like sentriesaroundPolaris, the North Star. Thesemeteors are sometimes called the Umids, in a ratherunsuccessful attempt tomake clear that they originate from the direction of Ursa Minor, notUrsaMajor. Thefactthat Kochab is positioned so near to the north pole of the sky meansthat it almostnever sets for most viewers in the Northern Hemisphere. Andsincethe Ursids seem to fan out from this particular region of the sky, youcan lookfor these faint, medium-speed meteors all through the night if you careto. Thefact that they reach their peak on Dec. 22 to Dec. 23, however, is notgoodnews for prospective Ursid watchers in 2010, as this coincides with thefirstfull night of winter, with a brilliant nearly full moon that will shinein thesky all night from about 5:00 p.m. local time onward. Thisisunfortunate because the underappreciated Ursids "badly needobserving," according to the British Astronomical Association. Thatobservershave neglected the Ursids is not surprising. Everything about them iswintry. TheUrsidmeteor shower usually coincides with the wintersolstice, and is best seen by polar bears since they comefrom near thecelestial north pole. In contrast to the Geminids, which can produce upto 120meteors per hour, the usual Ursid rate is but a fraction of that;generallyspeaking they produce about a dozen or so per hour at their peak. TheUrsids are actually the dusty debris shed by the periodic comet Tuttle8P/Tuttle, which circles the sun in a 13.6-year orbit and was last seeninearly 2008. On occasion, the Earth has interacted with a dense, narrowstreamof particles shed by this comet, which has caused brief outbursts ofUrsidmeteors numbering in the dozens per hour, but no such interaction isexpectedthis year. Butdon'tcross the Ursids off your observing calendar just yet. As I notedabove, thisyear they coincide with a brilliant almost-full moon, which likely willsquelchvisibility of most meteors. If only the moon weren't in the sky? Andpossibly a few Ursid meteors too! Usually not many people would beoutside on acold late-December night looking up at the sky, but the eclipse will bethefeature attraction that will draw many outdoors. Soif,while you're admiring the totally eclipsed moon, you happen to alsocatch sightof a few meteors streaking from out of the northern part of the sky,congratulations! You've probably caught sight of the Ursids.